The interactions between environmental arthropods and humans are manifold and give rise to different dermatological pictures and, above all, to different symptoms. 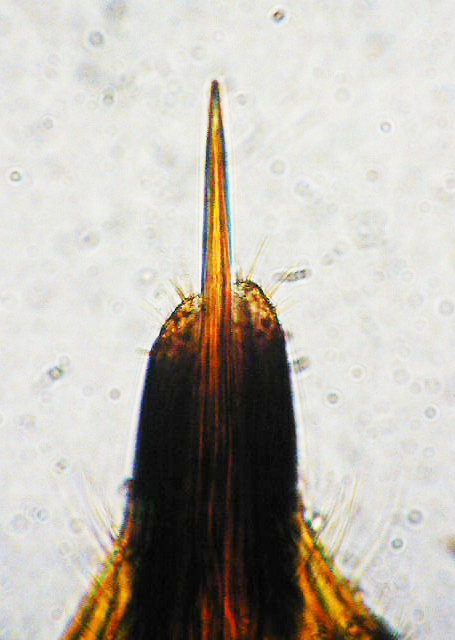 From the simple itching caused by the contact with the irritating bristles of the larvae of the beetles Dermestidae, frequent in the houses, one can arrive to a scabies-like picture produced by the contact with the bristles of mites of the genus Glycyphagus, Lepidoglyphus, Aeroglyphus and micro-papular-pustular lesions that define the picture of the so-called “false scabies”. 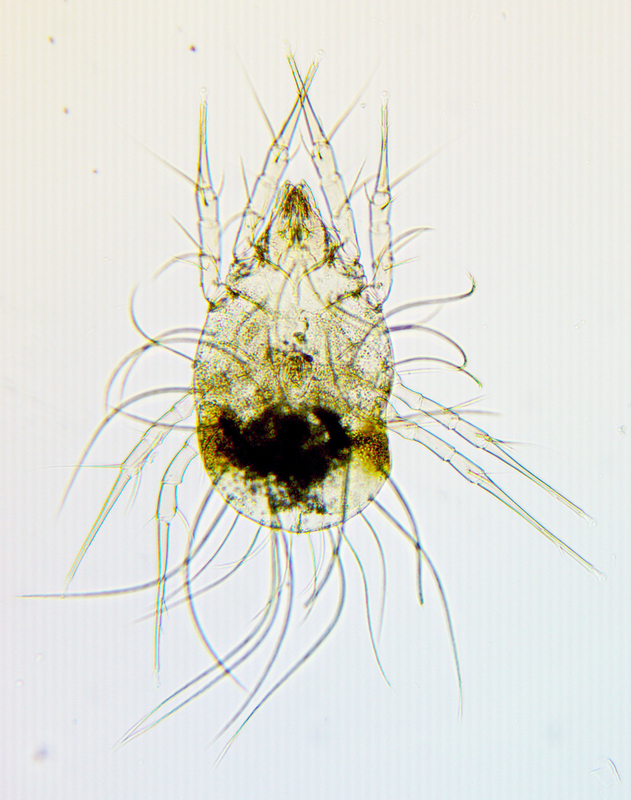 Sometimes the disturbances complained by the patient are imply referred to a “sensation of walking on the skin”, often produced by mites that do not sting, such as Dermatophagoides or Euroglyphus that sometimes colonise the clothes locating inside the seams. 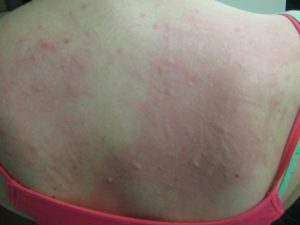 It is often, however, the misuse of insecticides on the skin that determines the sensitisation and therefore a hyperreactivity to any exogenous stimulus. Other times the problem is more severe and the skin shows the signs of real bites that arise inside the house, sometimes while we are taking a shower or while we use the iron. It is strange, but to understand it, it must be remembered that some mites, such as Pyemotes ventricosus (straw itch mite), give rise to lesions that can be manifested late, even 8-12 hours after the sting. 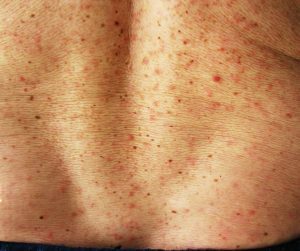 In most cases the punctures are immediately felt and the lesion appears to be as a micro-vesicle surrounded by an erythematous aura, the characteristic “strophulus”, e.g. 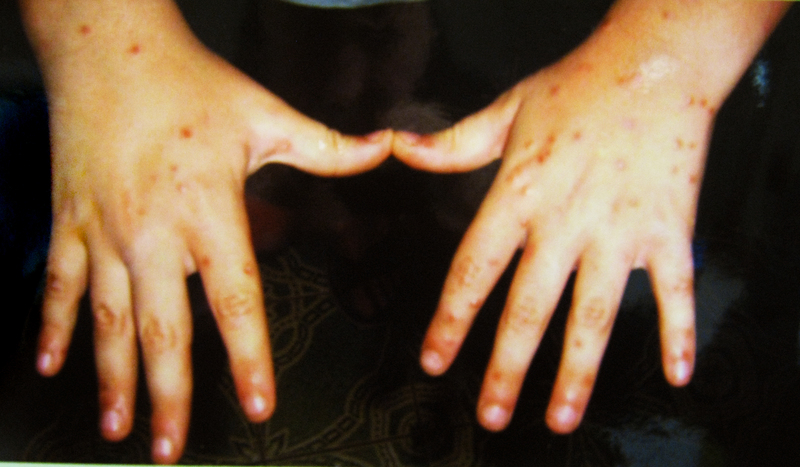 an erythematous-oedematous-vesicular lesion. 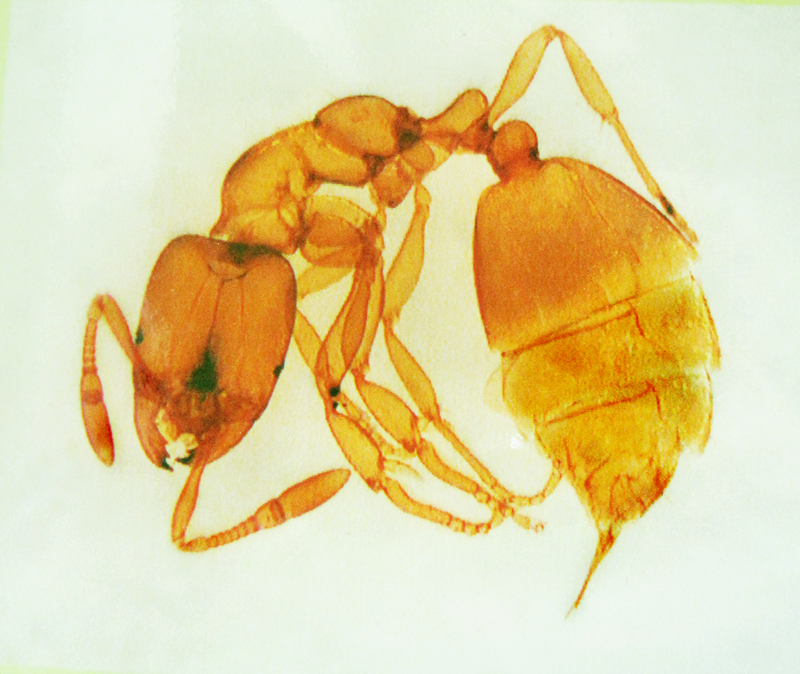 Many arthropods that sting humans, instead cause lesions of erythematous-papular-pustular type, as it happens for the stings of mites from animals, such as Cheyletiella or Ornithonyssus or even of microhymenoptera of the genus Allepyris. Other times the lesion is papular-vesicular or bladder-bullous (erythematous-oedematous-papular lesion) and is produced by the sting of the bed bugs (Cimex lectularius) or also by the stings of a microscopic aculeate ant entering frequently in dwellings: Solenopsis fugax (thief ant). Among the Hymenoptera that interact with humans, we can not forget two very well-known, namely Scleroderma domesticum and Cephalonomia gallicola: the latter recorded for the first time in Italy just by ourselves. These are tiny ant-like insects (actually belonging to the Bethylidae family) which live at the expense of the woodworm larvae, most often of the genus Oligomerus (O. ptilinoides). They also sting the man repeatedly, to the trunk and to the arms, causing lesions of “Strophulus“ type. 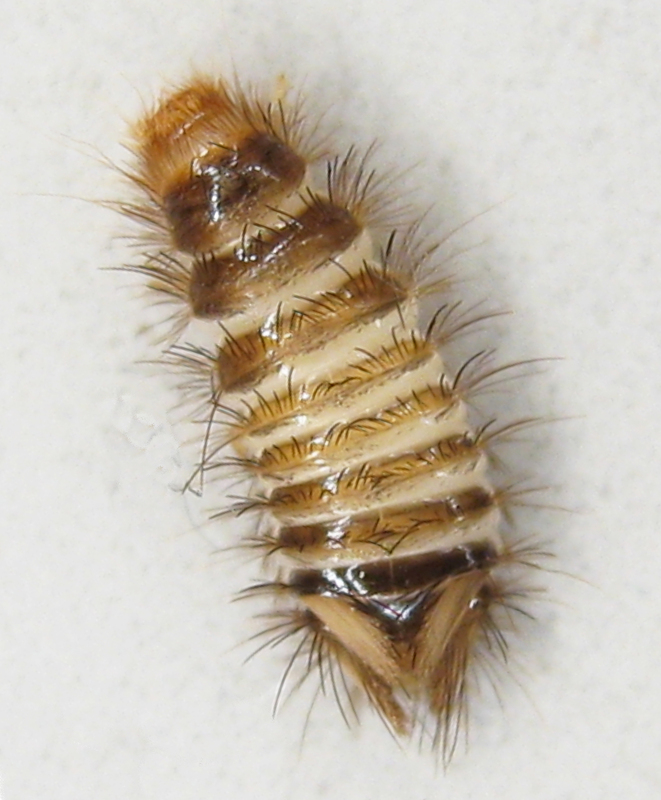 In short, it is difficult to orient, but it is certainly important to be able to identify the responsible arthropod that stings us repeatedly and, above all, to know where it comes from and where it is located inside the house. This can be known only through the E.D.P.A.®, the election exam to reveal the origin of an indoor entomodermatosis. Knowing who is tormenting us is important, because it allows us to act intelligently and in a targeted way. If the problem is Pyemotes, for example, we will have to remove and treat the woodworm eaten furniture. If the problem is Glycyphagus we will have to remove the moulds on the walls of our house. 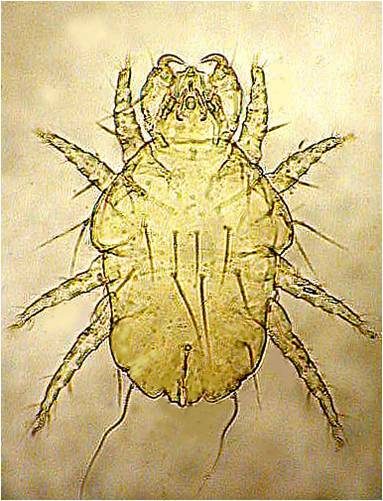 If the problem is the fleas, before treating the environment, we have to disinfect our pet. We can be told this only by the E.D.P.A.®, this extraordinary examination of environmental dusts, today available to everyone.